Gov. 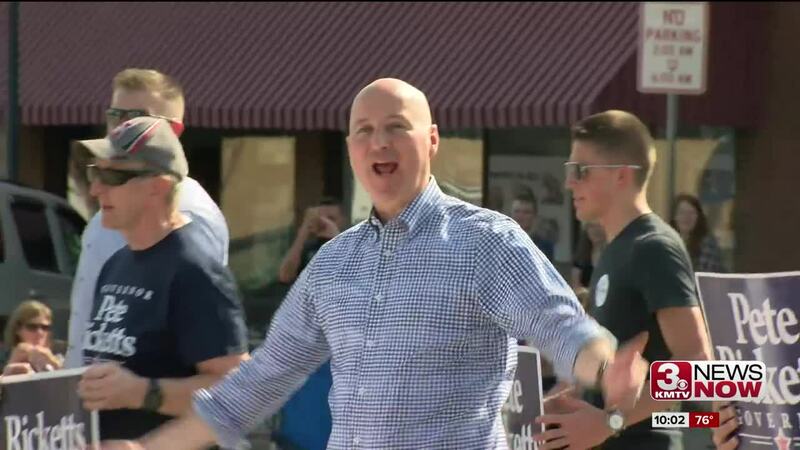 Pete Ricketts says a $12 billion aid package for farmers hurt by President Trump's trade war is a temporary solution, and he's encouraging the administration to reach new trade deals quickly. The week has been a rollercoaster for farmers, from tariffs cutting into profits to Trump’s announcement of what some are calling a bailout, and Nebraska and Iowa leaders have differing beliefs when it comes to the state of agriculture. Earlier Thursday, Ricketts said the package is a sign the Trump administration is supportive of farmers. He says he has helped connect administration officials to Nebraska producers and companies that are directly affected by new international tariffs . Thursday evening at the Saunders County Fair in Wahoo , Ricketts affirmed his belief in the president’s decision to help producers of pork, corn, and soybeans. "I think right now if you talk to farmers and ranchers, they are by in large in support of the president, they know we've got to have better trade deals," Ricketts said. "Obviously they're nervous about what's happening in commodity prices. And at the end of the day, what we really want to see is--let's get this wrapped up and let's start selling to those markets overseas." Ricketts made the comments while hosting a Japanese delegation that is visiting to promote trade. He signed a largely symbolic agreement with Japan's Hyogo Prefecture in an effort to strengthen Nebraska's relationship with the region. "It really is a commitment to strengthen those economic ties and cultural ties," Ricketts said. "We want to see more of that back and forth between Hyogo Prefecture and Nebraska because we've got a lot in common and we can benefit from more trade." The University of Nebraska and University of Hyogo signed a similar agreement Wednesday that will lead to new partnerships. As the Nebraska governor walked through the town of Wahoo, a Saunders County farmer watched the parade proceed. Randy Rasmussen usually worries whether his corn and soy beans will get enough rain or sunshine, but this year he's more concerned about tariffs cutting into his profit. "I will probably hold, hoping for higher prices with what I don't have sold," Rasmussen said. "Last year's crops I have sold, this year's I may be 40 percent sold. But there's 60 percent that isn't sold, that isn't very good prices unless this gets solved." Many farmers across Nebraska, like Rasmussen, are angry about the tariffs and are not optimistic about the coming harvest.